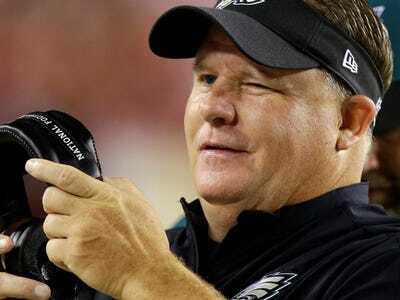 Philadelphia Eagles coach Chip Kelly is widely regarded as one of the most innovative people in football. When he came to the Eagles from Oregon in 2013, he brought with him an up-tempo offensive scheme that helped revolutionise the college game in the late-2000s. While he has toned down the pace and gadgetry somewhat in the pros, the Eagles still run one of the more unique offenses in the NFL. Other teams, especially Philly’s NFC East rivals, are going to great lengths to get their hands on the secrets of Kelly’s attack. The 60-year-old Aliotti was the defence coordinator at Oregon from 1999 to 2013. He was there for the entirety of Kelly’s tenure, and he’s clearly still loyal to his old colleague. If there’s anyone who knows how to go about stopping Kelly’s offence, it’s him. Philly is third in the NFL with 31.1 points per game.